Across much of Arizona there was more ozone in the air this summer than there was last year, including several days in Phoenix where the levels spiked into the unhealthy range. In 2015, the state budget included $9.2 million for a new veterans state home in Yuma. In 2017, $10 million was designated to build a state home in Flagstaff. However, construction is stalled on both projects because this state funding makes up only 35 percent of total costs. Attendees, organizers and lawmakers alike at the March for Black Women Sept. 30 put education and the treatment of black girls in Arizona’s schools front and center. The Arizona Department of Environmental Quality disagrees with its own advisory committee, which says current septic system regulations need a serious update to ensure protection of groundwater. Under a special permit, 26 breweries already made use of reclaimed wastewater as the basis for new craft beers. 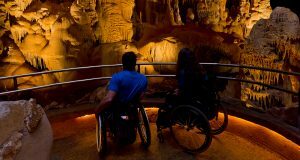 Battling national laws and attitudes that outdoor parks don’t need to prioritize accessibility for people with disabilities, the Arizona State Parks department has begun to take steps toward universal access. The Arizona Department of Environmental Quality expects reductions in grant funding from the federal Environmental Protection Agency, but a lack of specifics have impeded planning.